Each year, leaf blower manufacturers cut products, add new ones and generally work to confuse customers about what product is the same as last year. Toro has 10 products in their leaf blower line in 2017-2018. Many are new or have received an upgrade from previous years. There are a lot of features and specifications to consider if you want to find the best model suited for you and your yard. That’s where this guide comes in. We’ve put together an in-depth look into the various aspects offered on the market to help you make the best decision, as well as some of the best Toro leaf blowers. 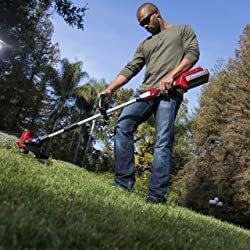 TL:DR - WHICH TORO LEAFBLOWER SHOULD I BUY? Out of the three models we recommended from Toro, we’ve chosen the PowerPlex as our best all-around value pick. The Lithium Ion battery pack makes moving around the yard a breeze without holding you down with heavy gas or an annoying cord, and one whole hour of battery life is plenty for most any sized job. While electric models tend to be the least powerful, you’ll have no problem getting the power you need to blow your leaves easily .The PowerPlex features an impressive 480 CFM for tough debris and numerous leaves. While it does lack a vacuum and mulcher, the time saved using this model is worth having to bag up some leaves in our opinion. Plus, it is incredibly quiet compared to the rest despite its higher power level. Without further ado, here are the things to consider when buying your leaf blower. Homeowners might find it harder than they first thought to pick out the best leaf blower for their needs, especially with so many types and models on the market. It can be hard to decide whether the sheer power of a gas engine is worth the noise, or if a quieter electric model will have enough strength to get the job done. What about backpacks vs handheld models, which do you need? It can all be a little confusing at first, but knowing the manufacturer lingo will help you to narrow down your search and choose a model best suited for your yard. When it comes to how powerful the blower will be, the CFM is what you will want to look for. CFM stands for cubic feet per minute, indicating how fast air can be blown out of the machine. This might also be measured in miles per hour, but cubic feet per minute is more accurate. A higher CFM indicates a stronger stream of air, with higher ratings being necessary for larger yards and those with an ample amount of leaves to remove each year. Take into consideration how large of an area you need to clear, and keep in mind that leaves are harder to remove from grass than they are from driveways and porches. While you may not need a mulching feature, it might be a better choice for those looking to fertilize, save space, or compost. This feature is measured in a ratio of how many bundles of leaves can be compressed into the size of one. For instance, a ratio of 5:1 would indicate that the blower can turn five whole bundles of leaves into just one. This can help to save space in the blower’s bag as well as lessen the amount of trash bags needed if you plan to throw the leaves away. The mulched leaves are also great for compost piles and act as a fertilizer for lawns as well as garden beds. When looking at the ratio of any blower, it should be at least 10:1 or higher. Now, the type of leaves and whether they are wet or not will affect that ratio, but anything less is not worth the price. This one might sound like personal preference since there are plenty who just can’t stand excessively loud leaf blowers. However, many communities have a ban on machines that are considered too loud. Check the decibel level, then check with your area to make sure the machine complies with any rules or laws before making a purchase. How Heavy and Fast Do I Need? These factors all depend on how you will be using your model, as well as what is in your yard. 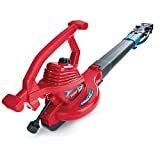 For weight, simply make sure that you will be able to carry this blower around for the duration of cleaning up your lawn. If it is too heavy, you might be less inclined to use it. Speed is an important factor is you have a garden, flower beds, or any other delicate plants in your yard. Believe it or not, high speeds can tear these things tight out of the ground or damage them to the point of killing them. You may want to consider a model with variable speeds to help protect your plants when removing leaves from in and around them. During your search, you might have noticed that leaf blowers are either powered by an extension cord, a gas tank, or a battery pack. Looking at the advantages and disadvantages of each will help you to narrow down your search. Gas powered leaf blowers are the most powerful out of three and are capable of handling yards well over an acre. However, they are also far louder and usually a little bit more expensive than an electric blower, especially factoring in the cost of gasoline. On the other hand, anyone with a hefty amount of leaves or an incredibly large yard might benefit the most from choosing this option. Their stronger airflow can help make such a large job an easier process. Plus, they also come in backpack models that make carrying their weight around less of a burden. This might be a good option if you already own a lengthy extension cord that can reach the width and length of your yard. Generally the quietest models on the market, there are heavy-duty and light-duty variants. When deciding between the two, make sure to look at the CFM to determine if the blower has enough power to tackle your leaf problem. Often, these blowers feature a leaf vacuum and mulcher capability that can help save on space as well as allow the leaves to be used for fertilizer or compost. If you are looking to fertilize your lawn or a flower bed, or simply reduce the amount of trash bags you use, then that versatility might be important. The disadvantage to these models is that they are tethered by your power cord. This can be a problem if yours does not reach as far as you would like it to. If purchasing a new, longer extension cord isn’t something you want to do then you might want to consider a different power option. When it comes to batteries, most modern blowers utilize a Lithium Ion cell that can be charged and reused just like any other power tool with a rechargeable battery. The major benefit is that you can ditch the extension cable, giving you the freedom to move all around your yard without any limitations. While they may not be as powerful as gas powered blowers, they still pack a punch. Make sure to look at the CFM on these models to ensure you end up with a blower that can tackle the leaves in your yard. 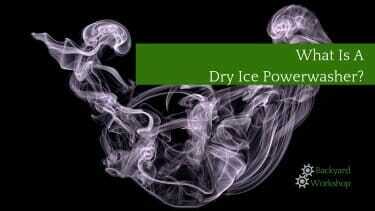 Just like in the air flow section, the size yard and surfaces on it will require different power levels. The only downside to these blowers is that the battery will run out of juice and need recharged. While you can avoid having to do this mid job by fully charging the battery, looking at the voltage before making a purchase will help you to pick the best model for your situation. While battery length varies widely by model, a safe estimate is that a 32v cell should be able to run continuously for at least 20 minutes. I personally look for a product with at least 40V batteries – anything else doesn’t have the run-time to make it worthwhile for me. Looking at the manufacturer and retailer websites will help give you a better idea of how long a model’s battery will last, as will any user reviews of the product. Now that you know a little more about the various aspects that different model leaf blowers provide, you can begin to narrow down your search for the best one. Based on the pros and cons of each power option as well as their CFM and added features, here are some of our top recommendations. If the freedom to move all around your yard without using an extension cord is important to you, then this model features a 40v Lithium Ion battery back to accomplish just that. The battery can be charged in about an hour and offers the same duration when in use. Those with flowers and gardens can use the variable speed to trigger to keep their plants safe, but still take advantage of the 480 CFM capabilities for heavier duty jobs. 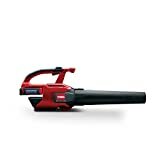 If having a powerful blower for the toughest of terrain is something you require, then you might enjoy the added Turbo feature this model has as well. The product weighs 9lbs altogether, so keep that in mind when deciding on how long you will be able to carry it around. While that isn’t exactly heavy, those with incredibly large yards might find their arms getting tired after a while. Unfortunately, this Toro model does not feature a vacuum and mulching ability. 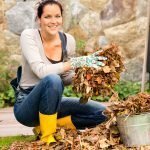 Those who use their leaves to compost and fertilize may want to consider another option. As for noise, the decibel rating on this one says zero. While that might not be entirely accurate, you may be surprised at just how quiet the engine runs. This Toro model features two separate nozzles for both blowing and vacuuming leaves, as well as a leaf mulching capability to help save space in the bag. However, there is no mulching ratio stated, just that it reduces 76% of mulched debris to less than ½ an inch. This still might be a good option for those seeking a well-rounded leaf blower. If you have a long enough extension cord, then you can use the cord lock system to avoid having the plug fall out during use. While this one is not as powerful as the PowerPlex model, at 240 CFM it is still useful for smaller yards as well as patios and driveways. The entire unit only weight 6.5lbs and features a handy shoulder strap for the bag, making it fairly easy to carry around. Noise wise, it is rated at 66.5 decibels which is just short of average television volume in a living room. Still, you may want to wear earplugs when using it. Those with larger yards might benefit the most from a gas-powered blower as they tend to offer the highest amount of power. In this case, Toro’s model wields a great 460 CFM air flow from its 25.4cc engine. Users can tone down the power with a variable speed switch to protect their plants and flowers, as well as connect the vacuum accessory for easy mulching. However, the tab to remove either nozzle requires a screwdriver to pry it loose, which you might find a little burdensome depending on how you want to use it. With a mulching ratio of 10:1, the capability isn’t the best but will certainly get the job done while helping you to save space. On the upside, the motor is commercial grade and as easy to use as any lawnmower. At 77.1 decibels, almost as loud as a freight train, you will want to wear earplugs to protect your hearing.